Dean Austin remains in the reckoning to become the new permanent manager of the Cobblers. The 48-year-old has been the caretaker boss at Sixfields since April 2, overseeing the final five games of the Sky Bet League One season. Austin could not prevent Town slumping to relegation during his short time in charge, but he significantly raised performance levels and spirits, and will hope he has done enough to persuade chairman Kelvin Thomas and the board of directors that he is the right man for the job. Under the former Watford assistant boss, Cobblers claimed two wins, two defeats and one draw, with him having taken the reins following Jimmy Floyd Hasselbaink’s sacking and the club on a nine-match run without a victory. 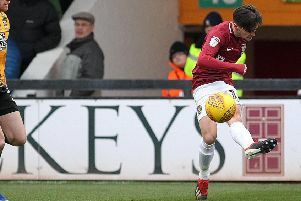 Austin was assistant to Hasselbaink throughout his disappointing eight months in charge, but the players certainly responded positively after he took charge, although relegation was still confirmed following the last-gasp 1-0 loss at Walsall on April 28. Many of the squad have come out in praise and support of the former Tottenham Hotspur and Crystal Palace defender, saying he deserves a chance to become manager, and they are waiting now to see if that will be the case. The latest player to throw their weight behind Austin is John-Joe O’Toole, who said: “Since Dean’s come in he has been so refreshing, just to have a different approach, and he deserves a lot of credit. “Where we were four weeks ago, I think everybody had just ruled us out and things were pretty flat to say the least. “But once Dean come in it was a breath of fresh air, and obviously we fell a little bit short but it wasn’t for the lack of trying. “We had a right go, and it is so disappointing we didn’t stay up, but we went about things the right way, and had a right go. There has been no word yet from the club on the managerial situation, but Austin did oversee the announcement of the retained list earlier this week.